Working in/with Creative Discovery, exploring the circle and all its colours. 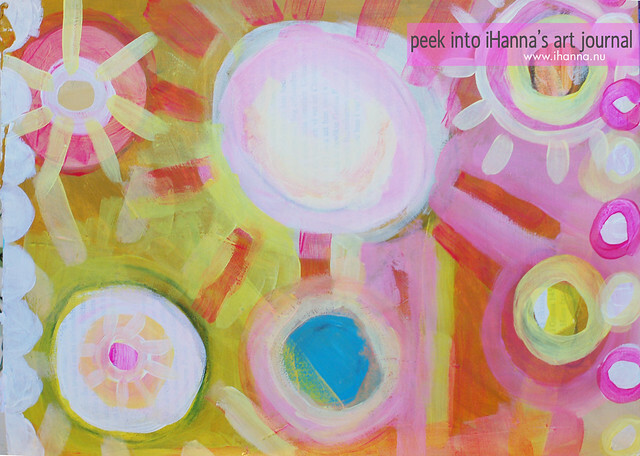 Circles that starts to shine as soon as I’ve painted them, turning into little balls of sun. Radiating warmth and happiness, like a universe without frost or snow. I’m filled with the afterglow of painting. 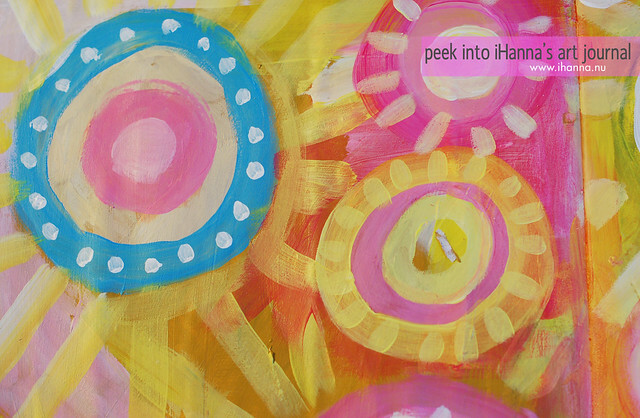 This entry was posted in Art journaling and tagged acrylics, art journal peek, exploring colour. Bookmark the permalink. No wonder you’re filled with afterglow after making these lovely colored sun-balls. I really adore the colors in this spread, looks so summery. Thanks for sharing. I love this spread! I love bright, happy, sunshiny colors. I’ve been playing in my journal lately, too, and just posted a new spread today. Oh wow, this is such a fantastic spread! Like I said on the previous one, I would frame and hang it :-) And I can really relate to “the afterglow of painting”! makes me want to get my paint out NOW! I just love these colors…painted balls of sunshine indeed…and I love the splash of blue SO much! 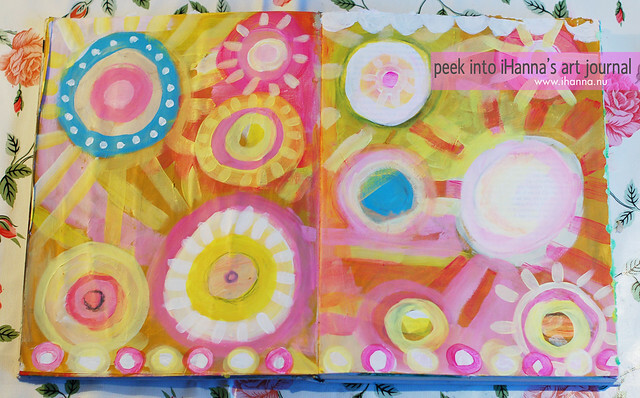 After I saw this happy-feeling art of yours, I did two more pretty pages in my collage journal! Thank you for the inspiration Hanna~! I always love your use of color and this time is no different. Lovely! What lovely inspiration, thank you Hanna!! Such happy and sunny colours. Made me smile. It’s a cold, grey and rainy day in the Netherlands… kinda depressing weather really. Thanks for lighting me up with these bright pages! Great circles! Painting does leave an afterglow. Finishing a piece is such a sense of accomplishment, too.